Raoul Comments: The Moon is not a planet. At least there’s no Space Sheep needed? Yay? This cover looks space opera, whereas the other was more fantasy. The title looks kinda like BIF PLANET. If ever there was an accident waiting to happen… just ask Bob Crane there. If that’s a big planet I want a refund. Looks like Captain Planet there is shooting a glue gun. Correct me if I am wrong, but, if that is drawn to scale, the Moon is not a planet and not very big. Someone needs to have a long sitdown with the folks at Telemetry, or they’re going to go through an awful lot of rockets. @B.Chiclitz: As a former Corby resident, I salute you. GSS. This looks like the kind of tableau I’d make with the action-transfers that came free with special packs of Weetabix or Sugar Smacks, c.1971. Rather than use the ‘action background’ painting on the back of the packet (an alien jungle or city) I’d just put the Letraset pictures on a blank sheet of foolscap, sometimes accidentally putting one over another. It would explain the randomness. I think I got ’em in boxes of Super Sugar Crisp, and did the same thing. If any of those objects are to scale (like the domed city, much less the people), then it’s not a very big planet at all. Smaller than the moon, larger than The Little Prince’s world. Yon beastie seems to be the unholy spawn of a brontosaurus and a camel — check the hooves. The craters and so on really do scream “airless moon” rather than “huge Earth-like planet.” Perhaps the artist just happened to have a picture of a moon handy and slapped SFnal stuff on it? Maybe those other planets are supposed to be orbiting around it, emphasizing its BIGNESS? Or is it an early Buck Rogers/Looney Tunes space travel universe, where the sky in space is full of randomly drifting nearby planets? @GSS: the book is definitely in the Planetary Romance tradition, which is to say it’s more John Carter roaming Mars than Louis Wu exploring the Ringworld. @Bruce: you mean the B&W Orson Welles clapping GIF? I agree this would be more appropriate as a universe for Duck Dodgers in the 24th 1/2 Century. When rocketships play “Chicken,” either both win… or both lose. @GSS ex-noob: that’s the one. 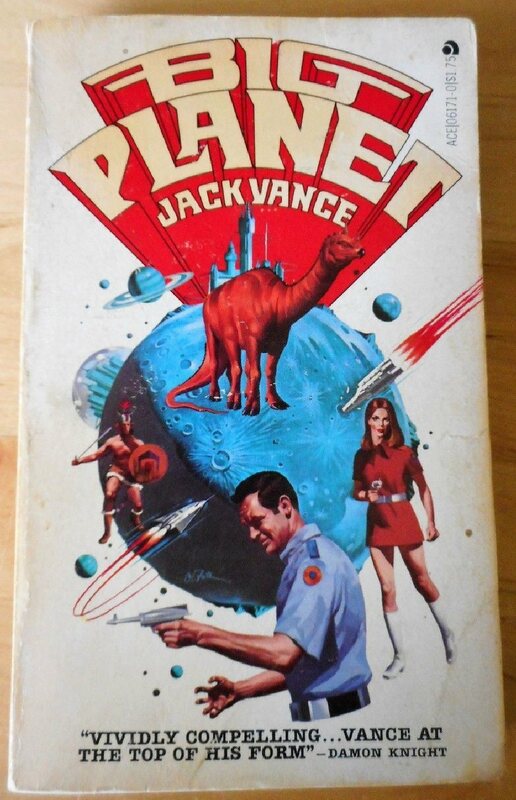 Jack Vance is clearly the dinosaur’s name.